The Tour of Britain's journey through Derbyshire proved to be a day to remember for lots of people, whether cycling enthusiasts or new to the sport. The Stoke to Nottingham Stage Six that took in plenty of the county between Buxton and Ilkeston was won by Etixx-Quick-Step's Matteo Trentin. Below you can view an image gallery of some of the pictures taken from around the route. Watch what people thought of the Tour of Britain coming through Derbyshire. 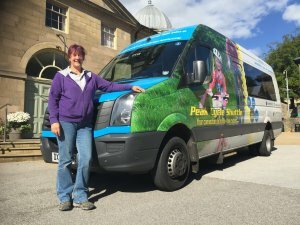 Derbyshire Dales' Cycling Participation Co-ordinator Ruth Taylor on what the race means in the county and her district in particular. Alfreton Cyclists' Touring Club were among those on Beeley Moor to see the professional riders speed through Derbyshire. Rider delighted by the support of the 'home' crowd and hopes to inspire future stars from the county. This year's Aviva Tour of Britain headed through Derbyshire on September 11 and featured some of the world's top professional cycling teams. The 91-mile stretch through the county ran from just outside of Buxton to just outside of Ilkeston and took in Whaley Bridge, Castleton, Bakewell, Beeley, Matlock and Belper. It made up the majority of the 119.9 mile stage six from Stoke to Nottingham and was not only one of the biggest tests for the riders, with plenty of climbs, but also offered some of the most beautiful scenery for spectators. Local businesses were encouraged to support and enjoy the event, as were schools. Derby-based Team Raleigh GAC were one of 20 squads who featured in the race, along with nine UCI WorldTeams. Heading up that list of nine were Team Cannondale Garmin, who won the 2014 Tour of Britain with Dylan Van Baarle, the Etixx Quick-Step team of Mark Cavendish and World Champion Michal Kwiatkowski and, of course, Team Sky. This year was the first time the race has been sponsored by Aviva, the largest insurer in the UK. Find out how you can have a go at cycling and where to ride in Derbyshire. 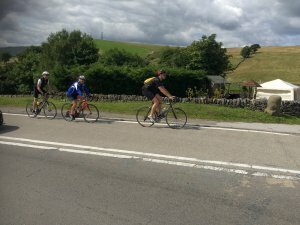 See what it's like to ride the spectacular Buxton to Belper section of the course, ahead of the race on September 11, with the team from County Sports Partnership Derbyshire Sport. Music: 'Summer Toes' by The Spectacular Fantastic. 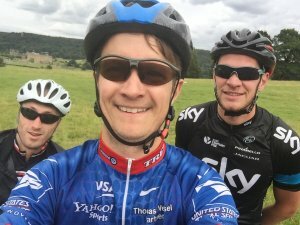 Four intrepid riders from the Derbyshire Sport team – Lewis Adams, Matt Halfpenny, Martin Hird and Craig Homer – rode up to 75 miles of the Aviva Tour of Britain route that passes through Derbyshire on September 11. Via one or two wrong turns, they encountered some stunning scenery, tasty bacon and brie baguettes and tough hill climbs that gave them an enormous sense of achievement when conquered, as Matt describes. Not only are the legs nice and fresh as we head off from the Devonshire Dome in Buxton, but the sun is out and there's a long downhill stretch heading down towards Whaley Bridge after a short initial climb. "We'll be there by lunchtime!" quips Craig, as we pass over the busy A6 that links Manchester and Derby. The biggest problem so far has been trying to set up Martin's on-board camera for the video we're making… BBC Outside Broadcasts, we ain't. Onwards we go through the beautiful villages of Buxworth, Chinley and Chapel Milton where the twin railway viaducts really catch the eye – those Victorians certainly knew how to build – and into Chapel-en-le-Frith. Dubbed the capital of the Peak District and built by the Normans in the 12th century, there's no time to stop to view the historic Church of Thomas St Becket as we head for Sparrowpit and then on towards Castleton. A short, steep climb has Craig gasping and Martin trundling in behind us all after his chain comes off. Still, nothing serious. It's very much a 'wow' moment as we start the steep descent down Winnats Pass, one of the most famous roads in the county among cyclists, towards Speedwell Cavern. Most like to challenge themselves to conquer the climb, but we're glad to be going the other way as we pass people puffing away up a slope that reaches a gradient of 20 per cent towards the top. Thankfully all our break cables are working and we soon arrive in Castleton, passing a cavalcade of inviting pubs with signs for good food. Unfortunately, it's just that little bit too soon to stop and settle Lewis' grumbling belly! Top ToB viewing place: Buxton town centre. Once the pros have gone through, there's plenty to see, including the Devonshire Dome, Pavilion Gardens and Poole's Cavern. Monsal Head viaduct - one of many great sights on the route. After winding through the tourist traffic and continuing on through Hope and Hope Valley we make it to the one-third marker of our journey into Hathersage, popular among walkers and climbers, as well as cyclists. As it's a busy Sunday, we decide to dive into the nearest café with available seats, and it proves a decent choice. It takes the arrival of the food to quieten Craig down for the first and probably only time of the day – well, at least for the three minutes it takes him to eat his bacon and brie baguette. The friendly café staff could not be more accommodating to cyclists, offering to store our bikes around the back and allowing us to top up our water bottles. A quick look at the route over lunch suggests a lengthy climb out of Hathersage, which doesn't disappoint on that score, but the views down into the valley are fabulous and more than compensate. There's also the grit stone edge climbing meccas of Millstone, Froggatt, Curbar and Calver to look out for in quick succession. At Stoney Middleton we turn onto what becomes known as the 'Stocky-P road', after the rest of the team shoot down my description of Stockport, the ultimate destination if you continue along the A623 and then A6. Craig's not laughing, though, by the time we reach the other side of Wardlow and an old red phone box – those were the days – as a strength-sapping ascent sees him cave in and grudgingly accept an energy gel. The bravado of these Yorkshiremen, eh? 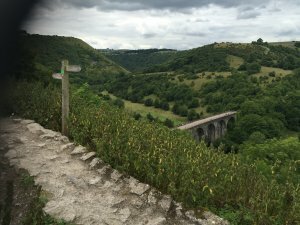 From there, it's a brief stop at Monsal Head to take in the striking viaduct in the valley below that hosts the Monsal Trail before setting off once more in the direction of Bakewell, via a cricket match at Ashford (my call to bowl an over from the Pavilion End falls on deaf ears). In Bakewell, the picture-postcard streets are a throng of shoppers and tourists. Top ToB viewing place: Hathersage. Spectacular scenery, delightful tea rooms and cosy pubs. A team 'selfie' outside the beautiful Chatsworth House. We pass over the River Wye as we climb out of Bakewell and at the junction of the A6020 that leads to the former Hassop Station, we part ways with Craig, who is soon to reach his pre-agreed finishing destination in Baslow. Having borrowed a bike and done little in the way of training, it's a great effort and, now he's forgotten the hard bits, he says he's thoroughly enjoyed it. For the remaining three of us it's on through Pilsley towards the magnificent Chatsworth House and gardens that date back to the 16th century and are home to the Duke of Devonshire. A quick selfie later – the house must surely be one of the most photographed buildings in the country – and we steel ourselves for the climb up to Beeley Moor – one of three category two climbs on the route. By the time we get to the top – Martin winning a little mini-race between the three of us – we're all breathing hard. Although not massively steep at an average of seven per cent, it goes on and on. Just when the end seems in sight, there's another kick-up lying just around the corner as the lactic build up in the legs grows. We cross beautiful moorland and pass Darwin Forest Country Park before descending through Farley to drop into Matlock, with the road into the former spa town revealing Riber Castle on the hill. Apparently, there's another famous hill climb up to the grade II listed country house, but that will have to wait for another day! Top ToB viewing place: Matlock Town centre. With Riber Castle in the background, the peloton will steam through at quite a pace. Riding through a busy Matlock Bath. Whether it's a sign of our growing fatigue or poor map reading by Lewis, we turn off the route for a few miles to head past the Heights of Abraham and through Matlock Bath, which remains a popular gathering point for motorcyclists and is home to the illuminations and Venetian Lights every September and October. We're soon upon Masson Mills - once an Arkwright-inspired water-powered cotton spinning mill – before re-joining the Tour route for the steepest ascent on our trip up Cromford Hill, which maxes out at over 15 per cent in gradient. It's a relief to make it to the top and be on our way to Carsington Water, a haven for wildlife, as well as a popular watersports hub. From here, it's 'home straight' territory with the scent of the finish line in our nostrils, but there's still time for me to have a mad five minutes. First my chain comes off on the descent to Turnditch and then, in attempting to catch up, I errantly follow two random riders, adding an unnecessary climb onto the distance. There's enough hills to go at already, without adding them on! After accruing 4,000 Derbyshire Workplace Challenge points, and more than seven-and-a-half hours in the saddle, we soon reach our final destination of the Belper North Mill – a breathtaking sight on which to end. A congratulatory pat on the back later and we're off home for tea. We all agree that it had been a memorable trip that has whetted the appetite for the real thing on September 11, but it's fair to say Sir Bradley Wiggins and co don't have much to worry about anytime soon! Top ToB viewing place: Belper town centre. The listed North Mill provides a stunning backdrop and it is set to host one of the intermediate sprints. To find out more about the Aviva Tour of Britain, including a stage six map and photos of the route through Derbyshire, go to the dedicated Derbyshire Sport page and also the official Aviva Tour of Britain website. The Peak District Shuttle bus and our driver for the morning, Dawn. The Derbyshire Sport team used the Peak Cycle Shuttle to carry their bikes hassle-free between their finishing destination at Belper North Mill and the start of their ride in Buxton Town centre. For pictures captured on their route, click through the image gallery below. 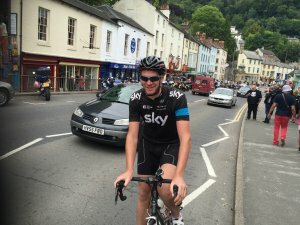 It might just inspire you to get out on the bike - or pick a vantage point to watch the Tour of Britain when it comes through Derbyshire on September 11. To save to your computer, right click on your mouse and then select 'save link as' (in Google Chrome). 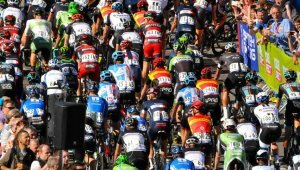 The Aviva Tour of Britain enters Derbyshire via Staffordshire and travels through the High Peak, the Derbyshire Dales, Amber Valley and Erewash before exiting to Nottinghamshire for the stage finish. Attached below are press releases relating to the Derbyshire Sport coverage of the Tour of Britain.